Research has shown that if you are happy with your spouse or partner, you will probably be healthier and wealthier too – so our most intimate relationships are definitely worth working at. When we feel emotionally secure, we are less likely to suffer from anxiety, depression and addictions, and more likely to cope with everyday hassles and stressors without becoming ill. If we feel we are loved unconditionally and valued for who we are, marriage can be a powerful defense against life’s curve balls. (I refer to marriage in this article, but much of what is shared applies equally to long-term, committed relationships). Marriages thrive when both partners take responsibility for nurturing the relationship and building an atmosphere of love and trust. Rather than just “going with the flow”, partners take a proactive approach and strive to be the best they can be. Journal writing is a fantastic tool for building strong marriages, either unilaterally (one partner journaling about the marriage and then discussing the issues with their spouse) or bilaterally (husband and wife using a shared journal). Don’t wait for a crisis to start keeping a marriage journal. Prioritize your relationship now and create a dream team! Begin by listing everything that’s good about your spouse and your marriage. Aim for a long list! What are you grateful for? Gratitude creates a positive atmosphere in your home and interactions. What is your favorite memory of time spent together? How can you show your partner that you are grateful for their positive attributes and behavior? Can you do something special to say “thank you”? Step back from your marriage and try to look at it objectively. What is the general trend or direction of your relationship? Is it getting better, staying the same, or developing problem areas? If you can see areas of difficulty, can you identify the reasons? Use your journal to brainstorm solutions for your problem areas. When and how might you discuss positive change with your spouse? Are you really angry about anything your spouse has done or failed to do? Offload your angry feelings in stream-of-consciousness expressive writing. Your journal won’t argue, yell or sob. It will accept your tongue lashing, no harm done. Just be sure to shred the pages afterwards and then, when you’ve calmed down, work out a non-threatening strategy for raising the issues that bother you. You can use your journal as a safety valve to avoid angry confrontations and safeguard your marriage. Whenever you feel angry about a situation, take a look at yourself. Did you contribute to the problem? Are you showing enough respect, love and warmth to your spouse? Can you suggest actions or improvements that benefit both of you? Try to identify win-win solutions. You can learn a huge amount about your marriage from keeping a shared journal. It can be quite revealing and interesting to see yourself through your spouse’s eyes! Always keep the tone predominantly affirming and affectionate, even if there are challenging issues to talk about. Include plenty of compliments and remember that a sprinkling of romance and wit will make the process much more fun. Discuss ways of having fun together and think of new activities to try together. Set dates and time slots to make sure it happens! Write a checklist in your journal of all the little non-verbal things that can bring you together- holding hands, looking into each other’s eyes, and dancing to your special song. When things are going well, you do these things automatically, but if one of you is stressed, you might forget to send out those special signals. Writing a checklist might help you remember that your body speaks the language of love. Lyn Alderson is a professional journalist, blogger and author, based in the English Midlands. If you want to find out more about the health benefits of keeping a journal, check out Lyn's e-book The Write Therapy: How Keeping a Journal Can Make You Happier, Healthier and More Productive available from the Amazon Kindle Store. If you want to learn how journaling can help you tackle life's challenges and create stronger relationships, please download the free eBook, The Journaling Guide to Manage The Stress and Strains of Life. Relationships play a tremendous role in your life. 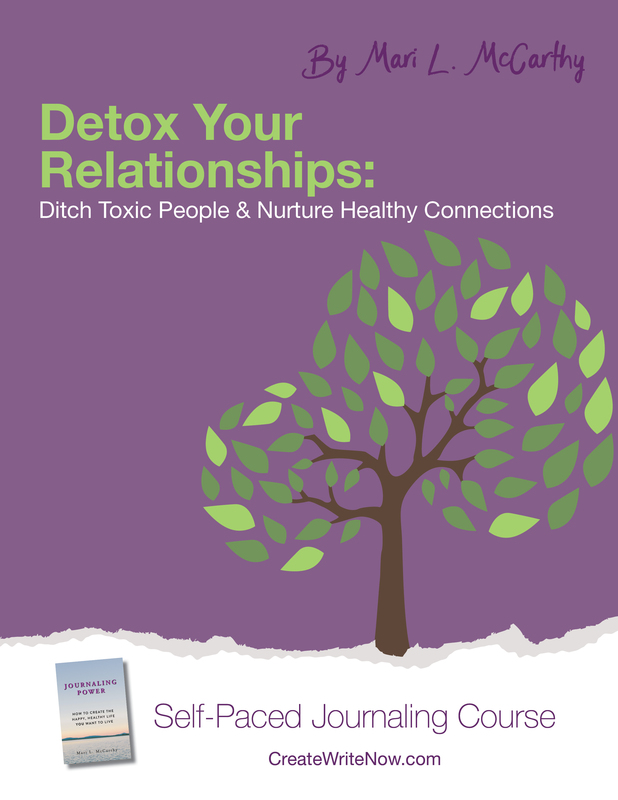 Identify what you value in, what you need from, and what you want to change in our self-paced journaling course, Detox Your Relationships: Ditch Toxic People & Nurture Healthy Connections.